Each H2O SOS water leak detection system is comprised of 3 primary components: a series of sensors, a controller, and a shut-off-valve. 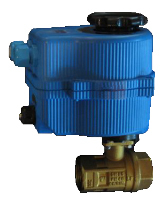 In simple terms, if any one of the system's sensors detects water, it will send a signal to the control panel which, in turn, will tell the special valve on the main water supply to turn off. This whole process occurs within a couple of seconds. With the supply of water turned off, a potential disaster has been averted, thus saving the devastation, expense, and headaches of flood damage and insurance claims (not to mention a lot of wasted water). 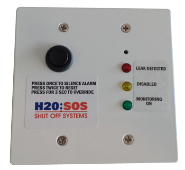 The microchip-controlled H2O SOS leak detector control panel is the "brain" of the system. 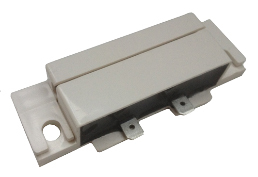 The controller conveniently mounts over a traditional electrical switch box, and features three LED-lights, providing system status information at a glance. An audible alarm is emitted from the controller when a leak is detected. Sensors are generally placed throughout your home at points of potential leaks/flooding. Points in the home plumbing system that are vulnerable to water leaks include hot water heater tanks, dishwashers, clothes washing machines (hose burst), refrigerator icemakers, under toilet tanks, central humidifiers, and under sinks. These sensors are typically mounted on the floor near a potential problem zone. Sensors can be arranged in either a hardwire or a wireless configuration (or combination of the two). Up to 250 sensors can be connected to one H2O SOS controller! However, for most residential applications, somewhere between 4 and 20 sensors will normally be installed. The sensors are extremely sensitive (if you lick you finger and touch the sensors, it will trigger the system! ); yet, they cannot be triggered simply by high humidity. The hard-wired sensors are connected to the controller using low-voltage wire (18 gauge / 2 wire recommended or gauge for 24v max. to meet code in your area) which can be purchased at any hardware or home supply store. For wireless configurations, a wireless receiver and at least one wireless transmitter are required. The wireless receiver is connected directly to the controller, while the wireless transmitters (powered by long-life lithium batteries - about 3 years!) are connected to the individual sensors that will send a remote signal to the receiver in the event of a leak. The wireless configuration is ideal for use in areas where it may be more difficult to run wire for a hardwired sensor. Each wireless receiver can support up to 32 wireless transmitters, and each wireless transmitter can be connected to up to 20 sensors. For convenience, we offer wireless transmitters with built-in water leak sensors as well. The shut-off valve comes with standard 3/4", 1", 1 1/4", 1 1/2", or 2" NPT threaded plumbing fittings to suit most applications without any pressure drop or flow constriction. H2O SOS shut-off valves are full-port for maximum flow performance, certified lead free, pre-tested in the open and closed position at 80 PSI, and temperature rated to 366°F. In the event that your H2O SOS detects a leak, simply check for water at the sensor locations. Once the leak has been found and corrected, simply press the button on the controller twice to reset and system and the water supply is restored.